Play on Gonzo’s Quest and find your own City of Gold with the amazing Avalanche cascade system featuring big reel multipliers. 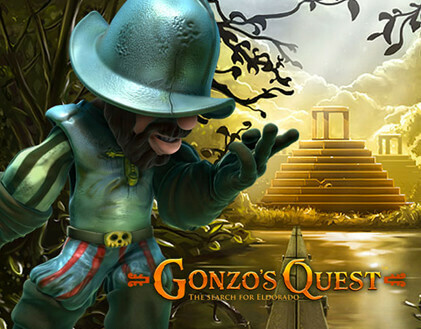 Team up with legendary slot scoundrel Gonzo, as he goes in search of untold wealth and fabulous bounty. Featuring interactive graphics, top notch sound effects and a game mechanic that crumbles stony reels with its Avalanche system. Once you’ve played this game you’ll be hard pushed to find one better. Gonzo’s Quest has 20 fixed pay-lines. 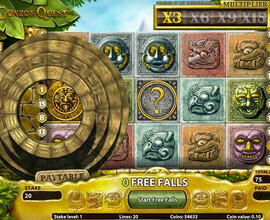 Select your coin size using the COIN VALUE button, and choose the number of coins per line with the BET LEVEL button up to a maximum of 10. The MAX BET button will start a game at the highest BET LEVEL for your current COIN VALUE. Hit the spin button to commence your game. During play any winning combination you achieve on the game grid will pay-out the appropriate prize and disappear, leaving spaces on the grid into which the symbols above will drop. This is known as an Avalanche. 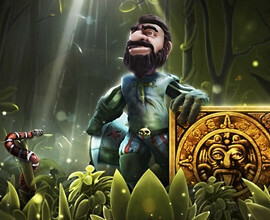 This mechanism increases a pay-out multiplier and gives you the opportunity to earn additional wins from the same game. Auto-play is available on Gonzo’s Quest. When you hit 3 bonus scatters on any active pay-line, this will activate the free spin feature. You’ll see a rolling stone animation and a pathway is opened up to El Dorado, where you’ll find a set of bonus reels. 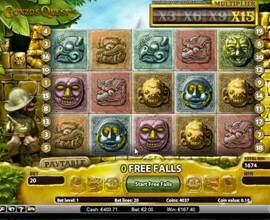 Here you receive 10 free spins, with the Avalanche cascading mechanism still in full effect. 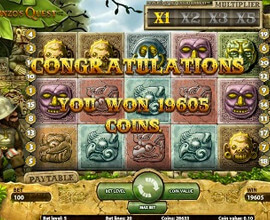 All multipliers are trebled for the duration of this bonus. Stop in 3 more bonus symbols on an active pay-line to re-trigger the bonus and add 10 additional spins to your count.